Use for fixture and novelty suspension, general utility use not requiring high strength. WARNING: DO NOT EXCEED the working load limits for chain or components. DO NOT USE for overhead lifting or hoisting. DO NOT USE if the chain or components are visibly distorted or worn. For playground and gymnasium equipment (1/0 and larger), farm and animal chains, and many general-purpose applications. The Playground Equipment Association has adopted the min of 1/0 Inco coil chain. WARNING: DO NOT EXCEED the working load limits for chain or components. DO NOT USE for overhead lifting or hoisting. DO NOT USE if the chain or components are visibly distorted or worn. Forged carbon steel for maximum strength. Spring steel snap rings. Zinc plated to resist rust. Forged carbon steel for maximum strength. Spring steel snap rings. Zinc plated to resist rust. For playground and gymnasium equipment (1/0 and larger), farm and animal chains, and many general-purpose applications. Do Not Use for overhead lifting. *Not Recommended for swing sets; the Playground Equipment Association, which has adopted the min of 1/0 Inco coil chain. WARNING: DO NOT EXCEED the working load limits for chain or components. DO NOT USE for overhead lifting or hoisting. DO NOT USE if the chain or components are visibly distorted or worn. For playground and gymnasium equipment (1/0 and larger), farm and animal chains, and many general-purpose applications. Do Not Use for overhead lifting. *Not Recommended for swing sets; the Playground Equipment Association, which has adopted the min of 1/0 Inco coil chain. WARNING: DO NOT EXCEED the working load limits for chain or components. DO NOT USE for overhead lifting or hoisting. DO NOT USE if the chain or components are visibly distorted or worn. A mild steel chain, zinc plated. Designed primarily for use with windlass and bucket to raise water from wells or cisterns. Forged carbon steel for maximum strength. Spring steel snap rings. Zinc plated to resist rust. Use for fixture and novelty suspension, general utility use not requiring high strength. WARNING: DO NOT EXCEED the working load limits for chain or components. DO NOT USE for overhead lifting or hoisting. DO NOT USE if the chain or components are visibly distorted or worn. For playground and gymnasium equipment (1/0 and larger), farm and animal chains, and many general-purpose applications. The Playground Equipment Association has adopted the min of 1/0 Inco coil chain. WARNING: DO NOT EXCEED the working load limits for chain or components. DO NOT USE for overhead lifting or hoisting. DO NOT USE if the chain or components are visibly distorted or worn. For playground and gymnasium equipment (1/0 and larger), farm and animal chains, and many general-purpose applications. Do Not Use for overhead lifting. *Not Recommended for swing sets; the Playground Equipment Association, which has adopted the min of 1/0 Inco coil chain. WARNING: DO NOT EXCEED the working load limits for chain or components. DO NOT USE for overhead lifting or hoisting. DO NOT USE if the chain or components are visibly distorted or worn. Use for hanging plants and lamps, drapery tie-backs. WARNING: Do not use for overhead lifting. 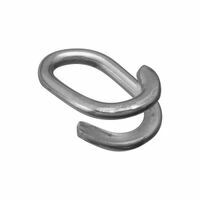 National Hardware Lap Link, Series: 3152BC, 1/8 in, Steel, Zinc Plated, 120 lb Load Capacity, Bolt Fastener, For Joining Two Lengths of Chain Together or Accessories to a Chain National Hardware Lap Link, Series: 3152BC, 3/16 in, Steel, Zinc Plated, 225 lb Load Capacity, Bolt Fastener, For Joining Two Lengths of Chain Together or Accessories to a Chain Forged steel, hot dipped, galvanized. Open-throat design, wide bow, screw pin shackle requires no tools to assemble. Slip screwdriver blade or hand punch through pin/eye and tighten. Meets Federal Specification RR-C-271F, type IV, Class 2. WARNING: Inspect regularly. Replace if worn, distorted or damaged. Ensure pin is fully engaged. Seize pin with wire. Do not exceed WLL [Work Load Limit].Use only Duty Rated Shackles, with embossed WLL,for overhead lifting. 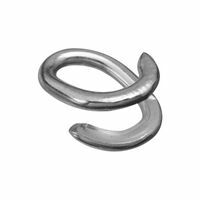 Campbell Welded Ring, 1 in Length X 0.18 in Wire Size, Steel, Nickel Plated, 200 lb Load Capacity Use for fixture and novelty suspension, general utility use not requiring high strength. WARNING: DO NOT EXCEED the working load limits for chain or components. DO NOT USE for overhead lifting or hoisting. DO NOT USE if the chain or components are visibly distorted or worn. Use for fixture and novelty suspension, general utility use not requiring high strength. WARNING: DO NOT EXCEED the working load limits for chain or components. DO NOT USE for overhead lifting or hoisting. DO NOT USE if the chain or components are visibly distorted or worn. Use for hanging plants and lamps, drapery tie-backs. WARNING: Do not use for overhead lifting. Designed as a temporary chain link repair, use one size bigger than chain. Can be used to couple chain attachments. Do not reuse after closure. Manufactured from steel. For connections of chain and attachments (Not for overhead lifting). WARNING: DO NOT exceed working load limit. Factory number indicated thickness (inches). Forged carbon steel for maximum strength. Spring steel snap rings. Zinc plated to resist rust. Forged steel, hot dipped, galvanized. Open-throat design, wide bow, screw pin shackle requires no tools to assemble. Slip screwdriver blade or hand punch through pin/eye and tighten. Meets Federal Specification RR-C-271F, type IV, Class 2. WARNING: Inspect regularly. Replace if worn, distorted or damaged. Ensure pin is fully engaged. Seize pin with wire. Do not exceed WLL [Work Load Limit].Use only Duty Rated Shackles, with embossed WLL,for overhead lifting. For playground and gymnasium equipment (1/0 and larger), farm and animal chains, and many general-purpose applications. Do Not Use for overhead lifting. *Not Recommended for swing sets; the Playground Equipment Association, which has adopted the min of 1/0 Inco coil chain. WARNING: DO NOT EXCEED the working load limits for chain or components. DO NOT USE for overhead lifting or hoisting. DO NOT USE if the chain or components are visibly distorted or worn. For playground and gymnasium equipment (1/0 and larger), farm and animal chains, and many general-purpose applications. Do Not Use for overhead lifting. *Not Recommended for swing sets; the Playground Equipment Association, which has adopted the min of 1/0 Inco coil chain. WARNING: DO NOT EXCEED the working load limits for chain or components. DO NOT USE for overhead lifting or hoisting. DO NOT USE if the chain or components are visibly distorted or worn. Connections for chain and attachments. When using cold shuts with chain, use one size larger than chain size. With a hammer, drive the open end through the cold shut eye then peen the extended end to prevent opening. Note: Cold shuts should not be reused after closure has been made. Do not use for overhead lifting.